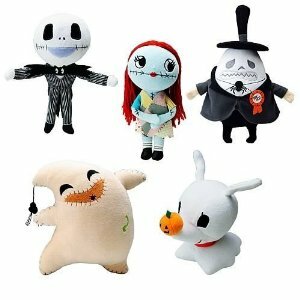 The Nightmare Before Christmas Characters: Who are You? We all identify with characters we see in movies. Who you see yourself as says a lot about you! Which Nightmare Before Christmas characters do you identify with? Read the descriptions below to see who you’re most like. Have fun – this is not scientific or psychological test, nor does it have anything at all to do with reality! This nightmarish skeleton always aims to please. He’s popular, charming and in charge, but during the course of the movie feels he’s losing his inspiration. Rather than give up, he strikes out to a new territory to find inspiration. It’s good to be you! Just take time for yourself. Put your feet up, read a book and learn to delegate some responsibilities. Sally, a poorly constructed rag doll of Dr. Finklestein’s creation, is Jack’s love. She isn’t too sure of his plan, but is dedicated to him just the same. She’s a determined gal, with a good head on her shoulders and a good feel for people. While you sometimes feel like you’re about to fall into pieces, you know what you want, and have a plan on how to get it. Don’t doubt yourself – your intuition and discernment will keep you on the right path. What a bad guy! Oogie is the Boogie-man with a twist. What appears to be a pile of sacking is actually a bunch of bugs, working together to take over whatever they can get! Under the control of the Lead Bug, this evil goes about creating trouble for everyone! He’s jealous, vicious and just plain mean. Be afraid! No one wants to hang out with the Boogi-man. You may attract a large group of brainless bugs, but real friendships will fall apart due to your greed and misuse of people. Get your act together! Here’s a confusing guy! Creator of Sally, the Doctor is jealous and overbearing, ‘protecting’ Sally from the world by imprisioning her. But he’s awfully fond of Jack, and when he needs help, Finklestein gives it freely. Later in the movie, he is taken over by Oogie and helps him. After rescue by Jack, Frank decides Sally is too much to handle and creates for himslf a new wife, more to his liking. Always acting like the people you’re around, changing personalities to fit the corwd? Be careful! Become confident in your own abilities. There’s good stuff in you if you grab hold of your own talents and humor and just be yourself. Literally a two-faced politician, The Mayor seems to have no real power in the day-to-day events of Halloween town. He is supportive of Jack and his radical idea, and in a later movie helps Jack rescue the leaders of the holidays. Shame on you! Just be who you are – one face, please! You do have power, and it’s in your willingness to help your friends. This trio seems all about making mischief! Not the brightest monsters in town, they always seem to mess up, kidnapping Easter Bunny instead of Santa, then dropping Santa off at Oogie’s instead of Jack’s. Are you Lock, Shock or Barrel? Do you enjoy being on the edge of trouble, egging it on and watching the chaos you can create? Remember – there’s a Boogie Man out there somewhere who’s more than willing to take advantage of you.